This topic contains 6 replies, has 5 voices, and was last updated by Barry W Davis 2 months, 1 week ago. 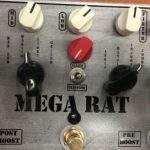 New to modding and pedal building. I have a kit to do the Keeley mod (ASE and ultra mod) on my stock DS1. I’ve found a couple of good walkthroughs at instructables.com and I think I have a pretty good idea where I’m going. Main snag at this point is my DS1 is an older, early to mid-90s model and the board is slightly different. The only differences that I think impact this project are that C5 on my board is an electrolytic type capacitor rather than the polyester film type on the newer boards. I don’t think this matters because I’m replacing C5 anyway. 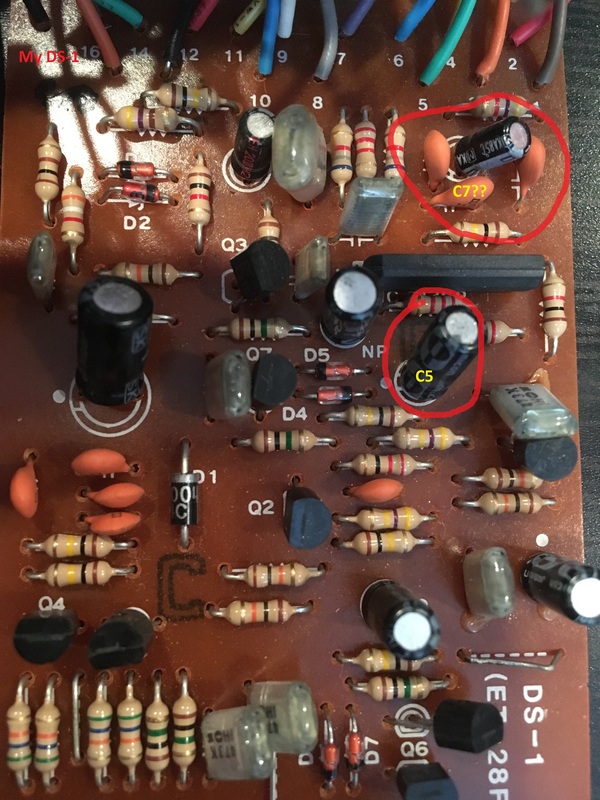 The other difference is the area in the top, right side of my board, which has 1 electrolytic type capacitor surrounded by 3 ceramic type caps. 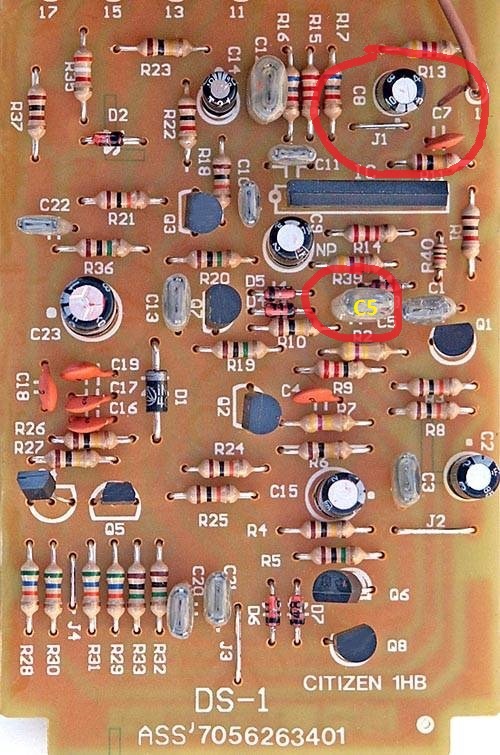 It looks like the newer board has 1 electrolytic type and 1 ceramic (C7), which I need to replace. I don’t mind experimenting, but any recommendations on which of the 3 ceramic caps on my board I should replace? How big a difference might this make to the final product? Oh man do I love modding DS1s. I have a pile of them in my collection that I’ve done all sorts of unholy experiments on in search of the perfect metal tone. Forgive me, however, as it was a while ago and I’m rusty. My suggestion is you head over to electrosmash and look up the analysis of the DS1 and see what those caps do. The different types (electro vs box) won’t have much effect, but swapping out the crappy ones it came with for better quality caps will show improvement. Or so I’ve heard. Let me know how you make out and if you want to dig any deeper than just the ASE and Ultra mods. I’ve found it needs some tweaks to the EQ section to really come alive. All super easy stuff to do! Another good idea is to swap out the clipping diodes (D6 & D7) with germaniums from Barry – it gives a very rich distortion. Also for an added touch, I like to change out the LED to make it clear that it is not a stock model. Agreed! All of my modded DS1s have swapped status LEDs. I’ve also changed the knobs to match the LED so I kind of have a theme. Someday I’ll have to gather them up for a family photo. I haven’t cut one up in a loooong time- I just bought one of the new black ones NIB from a friend- come to think of it I didn’t think to open it up to make sure its not all SMD inside. Whoops. I’ll check that tonight. 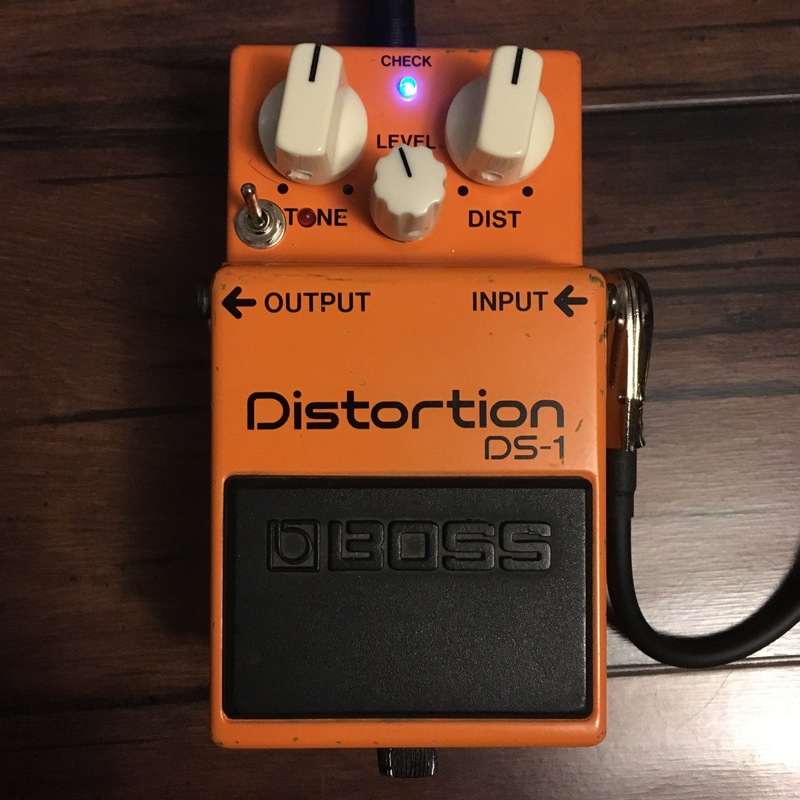 The plan was to make THIS one my ultimate DS1- the culmination of all my favorite mods and tweaks in one pedal. Thanks for the tips. This is the basic keeley mod, sounds waaay better. I might have to try some of these other mods you recommend.